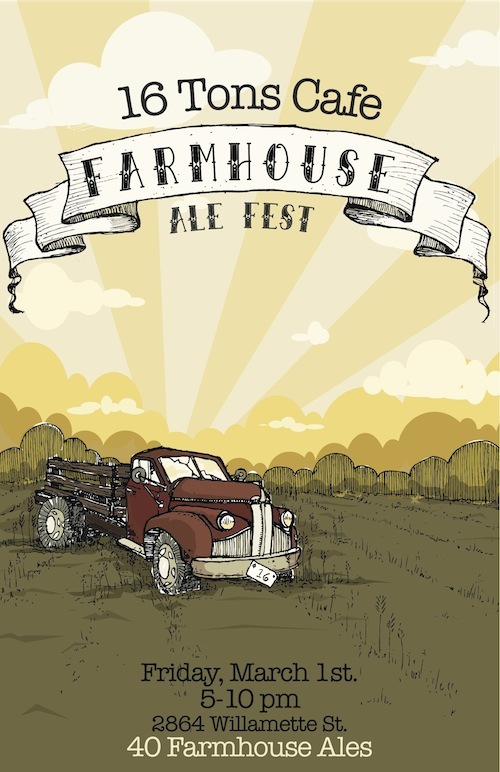 On Friday March 1, 16 Tons Cafe, the premiere beer destination in South Eugene, presents our 1st annual Farmhouse Ale Fest featuring 40 beers made in the French farmhouse tradition. Including special releases from Oakshire, Block 15, Agrarian Ales, Upright, The Commons, Logsdon, Pfriem, Ale Apothecary and other Oregon breweries. Farmhouse ales were traditionally brewed in the winter, to be consumed in spring and summer. Once an endangered beer style, a massive revival has recently taken place. Flavors are complex and include earthiness, fruit tartness, and mild spice. Logsdon and Agrarian produce their ales on working farms!